I recently experienced my first Nuit Blanche, an annual all-night outdoor contemporary art event held throughout downtown Toronto. The event featured a wide of variety of strange and exotic exhibits. The Heart Machine consisted of four giant steel “arteries” each connected to sensors that when touched the correct way caused giant flames to shoot up, warming the frozen crowd. 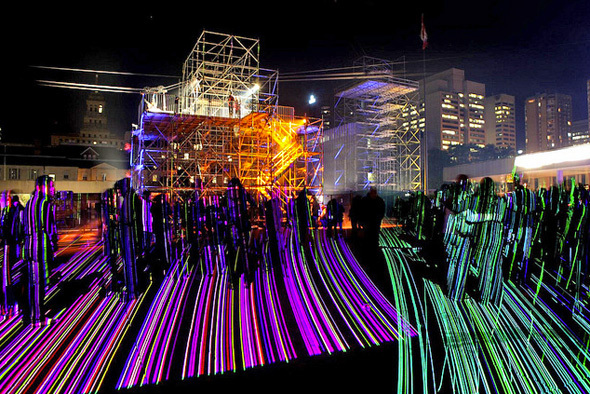 Flightpath Toronto, held at City Hall, showcased a spectacular outdoor laser show, while people flew overhead on a cable line. My favourite exhibit was Soon. Held in a large, open outdoor office courtyard, it was the most spectacular work of art I had ever experienced. Searchlights mounted atop office buildings continually scanned the crowds while smoke spewed everywhere. Sounds of helicopters, along with a strange, other-wordly noise, blasted from speakers. The effect was surreal – you were trapped in a bizarre, futuristic totalitarian state. Almost all the exhibits relied on modern technology: computers, large screen projectors, lasers, and cutting-edge sound and light systems. Without this technology, these exhibits would not be possible. Therefore, technology directly influences and is used by modern artists. Art (non-technical) communication is therefore influenced by current technologies. Technical (non-artistic) communication is no different. User guides are written in the language of the technology of the day. We have progressed from writing on walls, to writing on paper, to printing on paper, to computers, PDAs, smart phones and beyond. However, the goal remains the same: clear and concise communication. For both artistic and technical communication, the medium is more than the message – the message and the medium are inextricably linked and blurred beyond recognition. This blurring occurs in other ways. One of the non-official exhibits was The Red Dot. The theme was inspired by the practice in art shows of placing a small red dot on the descriptive tags next to paintings that have sold. Various sculptures made of red dots were on display, but in addition, large red dots were affixed to various items throughout the area: buildings, trees, doors, cars, and even people. The idea was that “art is everywhere”. The intent was to blur the line between art and the so-called “real world”. The effect was rather exhilarating. As my friend and I walked the streets, I began wondering what was real and what was art. At one point in the evening, I saw paramedics help out an ill person. Later, I witnessed a skirmish where several policemen forcibly held down someone resisting arrest. But were these real events, or were they staged? For a split-second, it was difficult to know. When anything can become art, art becomes anything. Although there is an “art” to documentation, documentation is not art. However, documentation, like art, can exist anywhere. With the liberation of information through the Internet, any one can become a technical writer through blogs, feedback on corporate websites, forums and any other online area where information likes to gather. This entry was posted in art by Andrew Brooke. Bookmark the permalink. I think the key is to keep it interesting for you AND for the readers. Once you keep the flame alive, all else falls into place.